In a tent, shivering to my bones, wide awake, lying on the cold ground and convinced I was having a near-death experience. Do you have a similar tale? Any camper or traveler surely will. Camping is one of the most liberating, exciting and fun of all outdoor activities. From sleeping bag liners to camping tarps, there are all sorts of useful equipment out there to make your experience that much more enjoyable. And this time, we’re going to be looking at the best camping cots to really take your evening under the stars to the next level. Don’t forget about the handy buying guide and FAQ below – just in case you’re clueless when it comes to the modern world of camping cots. Why Should I Use a Camping Cot? How Do I Find Out the Weight Limit? Can I Sit on the Side of My Cot? How Do I Clean a Camping Cot? Review: Coleman needs a little introduction when it comes to camping gear – and they may well pop up a few times in this review. Here, they kick us off with one of the cheapest camping cot options available. A simple, military-style construction made from a durable steel frame, it’s the perfect entry-level cot for casual camping. Perhaps that’s why it’s so popular. Not the lightest cot available. Crossbar tough to install for some. 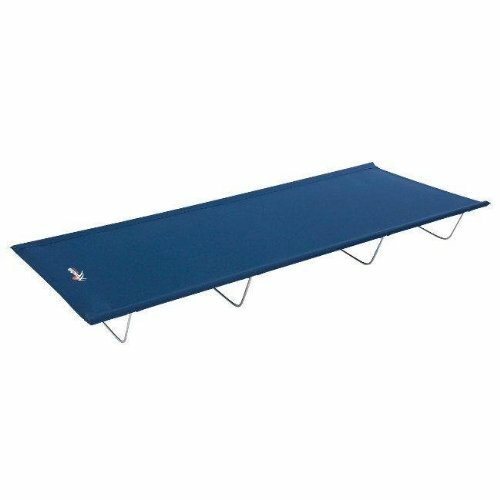 An all-around great starter and probably the best camping cot for the money you can find. I wouldn’t expect anything less from Coleman – one of the most trustworthy camping brands around. Review: Another nice, clean design with an easy assembly is this Mountain Trails cot. Offering a weight capacity of 225 lbs, its powder coated steel frame ensures strength and durability. It comes with its own carrying bag for ease of transportation. A genuine, no-frills mix of value and effectiveness. Low to the ground which might bother some. 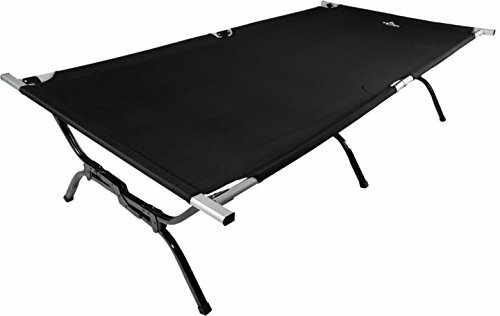 Lighter than the Coleman, this is another decent camping cot for those on a budget. Review: Made with a heavy duty, water-resistant Oxford canvas, this cot will support anyone up to 250 lbs in weight, with a steel X-leg design. The frame is aluminum and it comes with a decent carry bag. Gives you a further option in the budget cot stakes, with a nice choice of colors if you’re buying for the family. Review: Here comes another one of those Colemans – this time a more traditional, folding camping cot design. A steel frame can support up to 275 lbs across its coil suspension system. Comes with a thick, foam mattress and it’s super easy to fold and store. While being a little on the cumbersome side, it’s probably the best cot for car camping. It’s also great for use in the home as a backup guest bed. Review: Made from waterproof nylon this low-to-the-ground cot dismantles into a small pack that weighs only 4.85 lbs. It’s one of the best lightweight camping cots available – especially for the price – while still being able to support up to 280 lbs. It’s ideal for the more active camper given its portability and its ease of assembly. Comes with a detachable pocket and sleep mask. Low to the ground design not for everyone. A super portable option that’s great for hiking – fits easily into a backpack. Review: This is a versatile cot with a choice of adjustable positions. Made from 600D Oxford cloth, its heavy-duty steel frame will support up to 300 lbs. The removable headrest is a nice touch and can be used as lumbar support, which makes it one of the best camping cots for bad backs. A great cot to take to the beach, the lumbar support is useful for added comfort. However, it’s not the best for portability. Review: Similar to the Coleman ComfortSmart, this is a traditional folding cot with the advantage of a memory foam mattress. Its spring suspension will hold up to 300 lbs which doesn’t sag. It’ll certainly rival the Coleman as the best car camping cot, but it won’t be going anywhere without a vehicle. 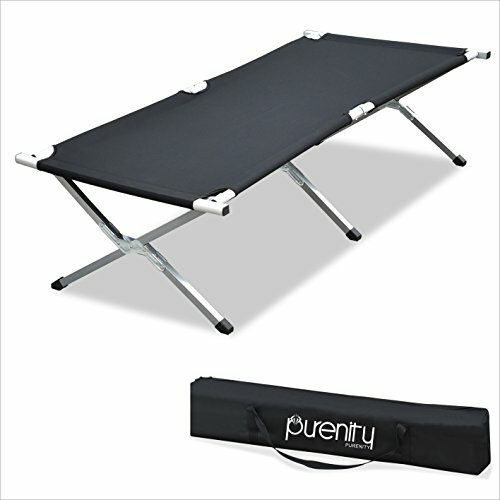 Easy to fold up or down, this is a great option for throwing in the back of your car or as a guest bed at home. Review: This is a solidly built cot with the ability to adjust your sleeping height. The sturdy and unique leg design can support up to 400 lbs on its quality ripstop 900D Oxford cloth. It packs up small to a surprisingly manageable weight of 8 lbs. Particularly good considering the durability and tough construction. Mud basket feet to prevent sinking. Bit of an effort to assemble. 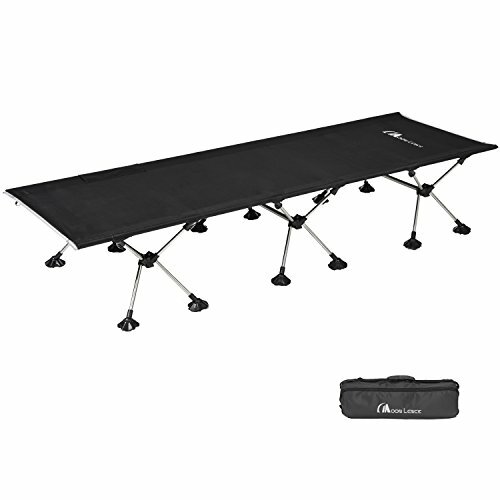 One of the best camping cots 2019, really well built and durable. Review: With a reinforced S-leg design, the Teton Sports cot can take a whopping 600 lbs of weight. 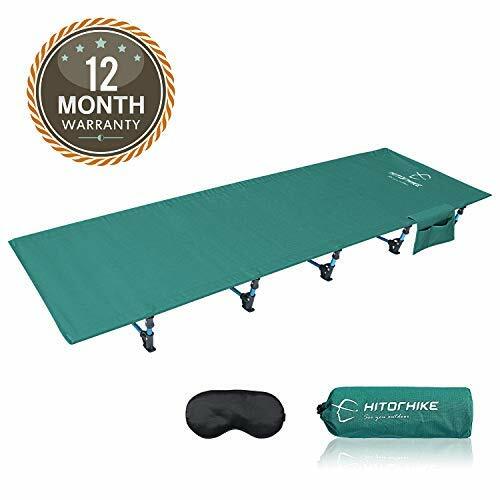 It’s larger than a twin bed, which means it’s a great option as one of the best camping cots for two, or if you just like starfishing in bed at night. It folds down into a carry bag for ease of transport, but at 26 lbs you’d better have a vehicle to transport it in. As sturdy as they come. Available with a special pivot arm to ease set up. 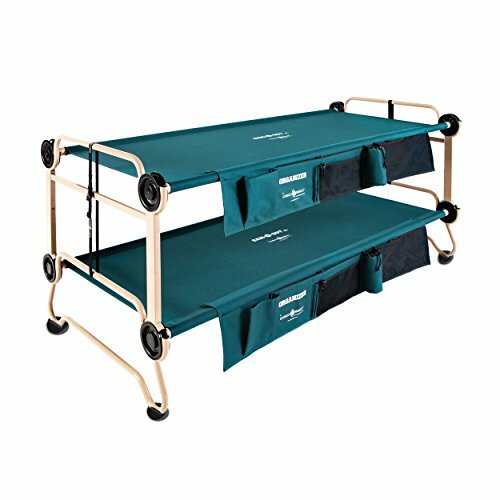 Easily one of the best double camping cots on the market. Snuggle up with your loved one in an awesome sleeping bag and get into this. Review: Supporting up to 256 lbs, this is another super-lightweight option that is one of the best cots for tent camping around. Extremely portable, it’s really easy to set up and dismantle, with aluminum rods and 420D ripstop polyester material. Not as tough as sturdier cots. For a light, portable cot for hiking, you can’t go wrong here. Those who prefer to be higher off the ground should look elsewhere though. Review: Coleman are once again knocking it out the park with this queen-sized airbed and cot, perfect for when you really want to do some glamping. Its steel frame will support up to 600 lbs and includes a 4D battery pump for blowing up the guaranteed airtight bed. Both cot and air bed pack easily into a storage bag for ease of transport. Side tables with cup holders. Option to separate air bed and cot. 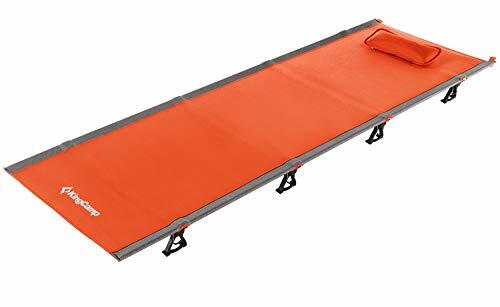 For the best queen size camping cot, you’ve come to the right place. It really doesn’t get better than this. Amazing as a guest bed in the home, too. Review: Weighing in at just 4.8lbs, this is another lightweight offering, making it great for hiking and climbing expeditions. Its aluminum frame can still hold a weight of up to 300 lbs, while the ripstop fabric is durable and sturdy. Like other mountaineering cots, it’s a breeze to set up and take down, with a shoulder carry bag included. Sleeping close to the ground again. You’d expect quality for this price – and you get it. One for the more serious campers among you. Review: Is it a tent? Is it a cot? Well, it’s actually both. 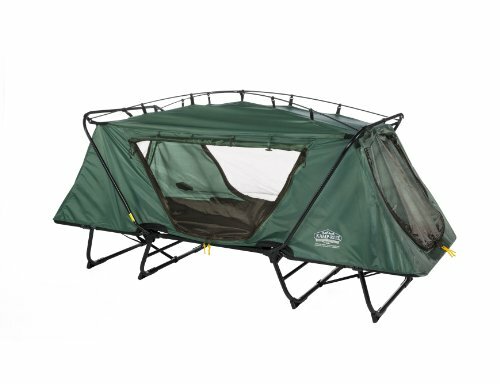 This extremely versatile offering from Kamp-Rite is a wonderful invention that combines a lounger, a 350 lbs limit camping cot and a 210D, water-resistant tent shell. It’s a great hybrid if you want protection from the elements without actually packing a tent. Ideal for fishing, hunting, birdwatching – or anywhere you want to spend time outdoors. For anyone who wants to get as close to nature as possible – you could do a lot worse than this. Plus, it just looks like loads of fun. Review: This piece of kit is for serious outdoors men and women only! 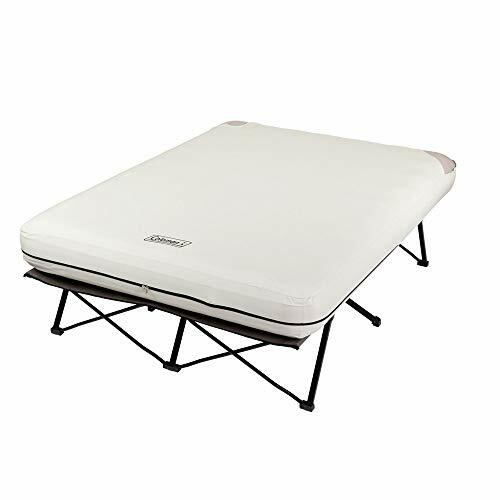 A welded aluminum frame has a height adjustment system that is ideal if you’re sleeping on an uneven surface, but it’s the 600D padded nylon fabric that is the real selling point. 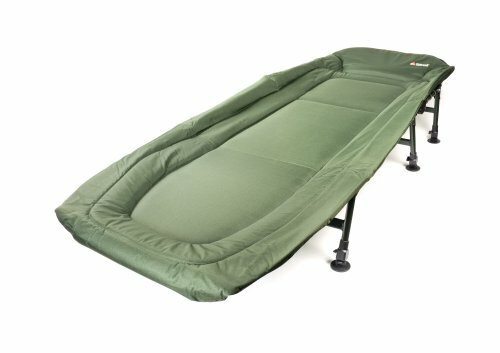 This could well be the most comfortable cot for camping, and certainly the best camping cot for side sleepers. It can also be folded into a lounger should you wish to soak up some rays in the daytime. It’s all about the comfort. If you can assemble this with no complaints and you’re happy parting with the cash, this will be one of the best night’s sleeps you’ll ever have while camping. Review: What a world we live in when this sort of product is available! A camping cot bunk bed, this is a serious piece of kit for serious campers. Each cot will take up to 500 lbs, built with rust-resistant, powder coated steel. You’ll have 21 inches between top and bottom bunks, and it includes two handy side organizers for all your bedside belongings. It can even fold into a comfortable bench or be used as two, separate beds. This is some next level stuff here. If you’re happy to part with the cash, your only problem is going to be arguing who goes on top! They do a kids version, too. Below, you’ll find plenty of useful information to assist you in choosing your next camping best friend. Perhaps the first port of call when it comes to selecting your cot is to establish what you need it for. If you’re marrying camping and hiking or climbing, you’ll obviously want a lightweight model that’s super portable. If it’s more glamping or car camping you’re into then you can lean towards larger and heavier options. Perhaps you need it to double as an extra put-you-up bed in the home? Or maybe it’s a combination of all three? Either way, decide how the cot is mostly going to be used and that will point you squarely in the right direction. Another very important factor to consider when it comes to choosing your cot, is how comfortable it’s going to be. The value of a good night’s sleep is never to be underestimated, particularly if you’re not in the lavish conditions of your welcoming bed at home. How comfortable a cot is will depend upon how it’s constructed, either with a spring-tensioned frame or with a taught fabric. Sometimes, support bars might get in the way and make for a lousy and potentially painful experience. Some models might come with a mattress, which will obviously result in better sleep, but the trade-off is you’ll have more to carry. It’s up to you to decide what you prefer and what works best for you. How you actually sleep will make a difference too and should be taken into consideration. Cots come in a myriad of sizes and weights to choose from, so you’ll need to figure out not only if it’s large enough to accommodate the height of the user, but if it’s going to fit wherever you intend for it to be placed. Heavier duty models will also weigh considerably more than backpacker, climber or hiker cots, with luxury models only really useful if you’re using a vehicle. Again, it depends on your chosen activity that will help you choose the right product. As much as cots come in all shapes and sizes, so do us humans. It’s very important that you adhere to a cot’s weight support limit. Most decent cots for adults should start at around 200-210 lbs, and to be honest, I wouldn’t trust anything below that – even if you’re as light as a feather. It’s just for peace of mind. Cots for children will be much less – but they’ll grow out of them eventually. Manufacturers do take the will and needs of the people into consideration though, and you will be able to get sturdy rigs that can take up to 600 lbs, plus. And if you’re looking for the best double camping cot, you’re going to want to be in this rough ballpark. Nobody wants their bed collapsing under them in the night. All of the above factors are affected by the type of material a cot is constructed from – both the frame itself and the sleeping area. Steel and aluminum frames are the go-to metals of choice. Steel is heavier and more durable, while aluminum you’ll generally find on lighter, more portable cots. Fabric cots are usually made from nylon or polyester with the higher the denier number indicating the higher the fiber thickness – and thus strength of the fabric. Spring frames will include either a mattress or thick padding, both of which will be made from a variety of fabrics and fillings. Also consider if the fabric needs to be waterproof or water resistant, and what is going to be the easiest to clean. In that regard, stay away from cotton and canvas if you can. Something that’s often overlooked with camping cots is how the product actually touches the ground. This is most likely to be in a tent, so it’s worth noting what sort of feet are attached to the support frame. Groundsheet fabric, while built to last, can often tear easily if it comes into contact with something it doesn’t agree with, or there’s friction of some kind. Consider where you’re going to be setting the cot up and how it might impact what it’s going to be positioned on. This can either be down to personal preference, or how much “give” a cot has compared to the sleeper’s weight. You want to ensure that once you climb into your portable bed for the night, you’re not actually still sleeping on the ground. That would defeat the purpose in the first place. Take into consideration how high a cot is off the deck while factoring in a body actually being in it – and you’ll have a clearer idea of what style to opt for. 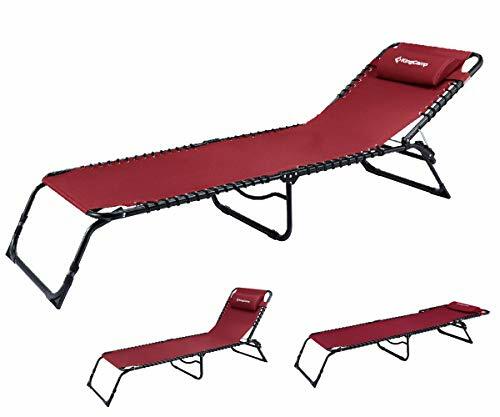 Traditional “camp beds” usually just fold on themselves – handy for a speedy set up or take down, but not so hot when it comes to portability. Backpacker/hiker/climber cots might pack right into a small bag, but they’re going to take much more effort to erect and dismantle. Also, if you’re the type of person that has nightmares about assembling Ikea furniture, these cots won’t be for you. Some have been known to have users tearing their hair out and screaming bloody murder. But again, this will all depend on what you require the cot for, as different cots will have different assembly instructions. It’s up to you to plan and choose accordingly for your needs. Certain cots might come with some added features to make life easier. Side tables or cup holders are a nice bonus – especially if you wear glasses or like to read – you’ll have somewhere to place your stuff before drifting into the land of Nod. Storage pockets that hang from the sides can also accomplish the same feat. There might be a built-in pillow or lumbar support available – which will go a long way to improving your night’s sleep. And many cots – particularly of the backpacking variety – will come with a carrying case as standard. A perfectly valid and reasonably question – especially if you don’t want to carry the extra weight. What’s wrong with sleeping on a mat in a sleeping bag? Nothing at all really, but the difference in your sleep quality is going to vary immensely between lying close to the cold, hard ground, and being in a nice, comfy cot. Whenever you’re sleeping that close to mother earth, you’re always at risk of having a dreadful night’s sleep, picking up a cold or flu, or having something unsavory crawl in with you. But ultimately, by keeping you off the ground a cot will ensure you’re cool in summer and warm in winter, while offering an altogether more pleasurable and enjoyable camping experience. 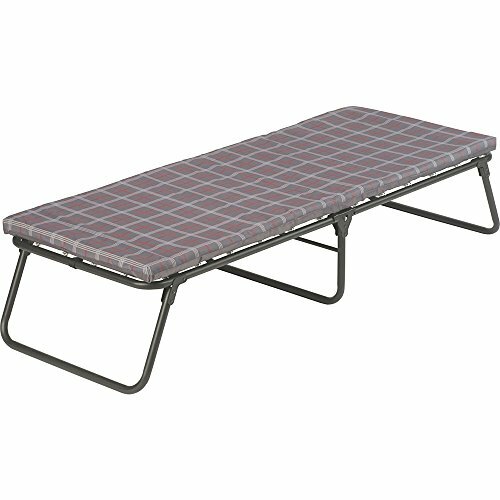 All camping cots will tell you their maximum weight limit somewhere in their specifications. Certainly, in all the cots I’ve reviewed, this figure is easy to find in the item’s description. As previously mentioned, I’d personally err on the side of caution and go with a heavier limit than you need – just to be on the safe side. Especially if you’re prone to tossing and turning in the night. This is a great question and one that is not asked often enough. I’m sure there are many stories of people flipping cots and ending up sprawled on the floor. Sometimes yes, sometimes no. It will entirely depend on how sturdy/weighty your chosen cot is (and how heavy you are). I wouldn’t risk it with the more lightweight cots, but certain people like sitting on the side of their beds to put their shoes on in the morning. If you’re one of those folks, check to make sure your cot of choice can take the weight of someone sitting on the edge beforehand, and save yourself a potentially embarrassing situation in the process. Most cots will be fine with a wipe down using warm water and a mild detergent. Make sure you check for any rips or tears after each use too. Left unchecked, you might get a nasty surprise the next time you try to sleep on it. Keep an eye out for wear and tear on the frames, and clean any dirt off with soap, water and a brush. Don’t overlook any rust either – and add a touch of oil or grease to any moving parts or poles to keep things working smoothly. In writing this review I became increasingly inspired to go comfort camping as soon as possible. Either that, or it made me feel really sleepy learning about cots. I hope that my research will help you find the best camping cot for you – and do please tell me about it in the comments below, or if you too have a nightmarish tale of sleeping in a tent. In the meantime – safe travels and happy camping!